You can use the free Demo version to test and preview this layout. A Premium, Personal or Lite edition is needed for deploying it. Switch to the Low-level editor. Move the mouse to the LAlt key (Left Alt, immediately to the left of the space bar), drag it, and drop it onto the LWin key. This will result in the swapping of VK mappings of the two keys. Important: do not hold the Ctrl key during the drag-drop operation - this ensures that dropping executes the desired move, ie swap operation. Now do the same to swap the RAlt and RWin keys. The ready-made layout file US MBP Swapped Alt and Win.zip contains these customisations applied against the standard US English layout. Fixing the positions of Alt and Win keys is a step in the right direction, but the customised layout still lacks the right Ctrl key, which can be an impediment in typical Windows applications, which rely heavily on Ctrl-based UI shortcuts. The starting point is assumed to be the layout where Win and Alt keys have already been swapped. Select the RWin key (immediately to the right of the space bar). This is the key that was originally mapped to RAlt in the "vanilla" layout. To make sure you have selected the correct key, the "Scan code" field should be showing 0x38 ext. 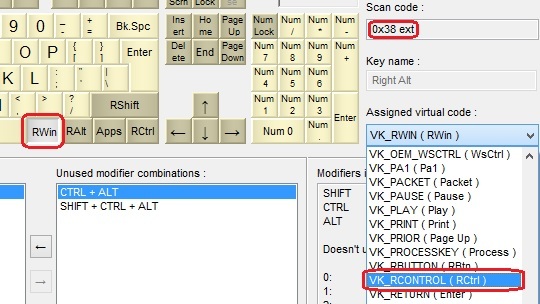 Now choose VK_RCONTROL trom the Assigned virtual code drop-down. Drag the RCtrl key, and drop it onto the RWin ie 0x38 ext key while holding down the Ctrl key on your physical keyboard. The ready-made layout file US MBP Swapped Alt and Win with right Ctrl.zip contains these customisations applied against the standard US English layout.